Today, We are discussing about a circuit which is suitable for middle school and high school students. It is funny and involving hand-on learning. 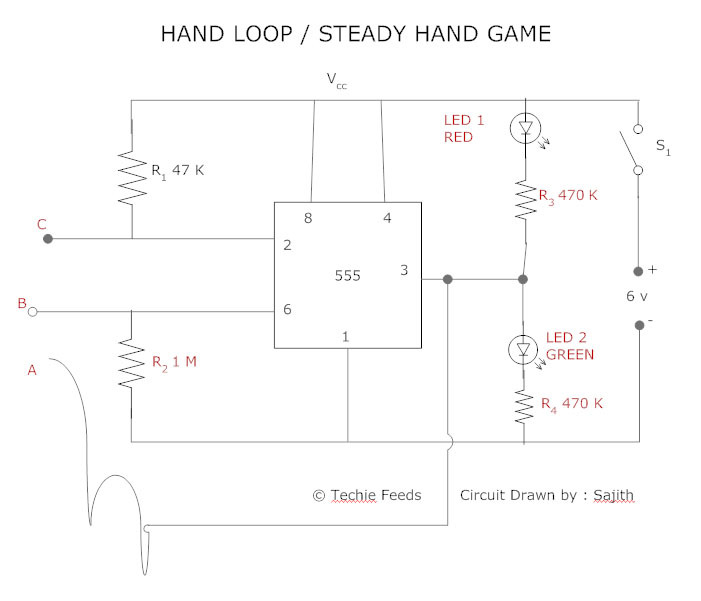 About the Simple Wire Loop Game. This game may familiar to you. It is available in market or on some carnival fests, it is introducing as a competition. Its is simple eye-hand coordination game involving a wire on hand and a small hole. The game is, the player need to hold the wire and attempts to guide it through the small hole. When ever the loop touches the sides of hole, Game will finished and a RED LED will starts lighting. We can improve its hardness by reducing diameter of the hole. Here, The player have to touch the point C, via the hole B without touching its sides, using the point A ( Should be covered its touching side by an insulator). While successfully touches the point C, you wins the game and a GREEN LED will blow. If the handle A touches on side of B, the ckt will be OFF and and a RED LED will start lighting. Working of Wire Loop Game. The main component of this circuit is a 555 IC. The 2nd pin ( Trigger ) of IC 555 is connected to +ve and pin 6 ( thresh hold) is connected to -ve. While the circuit is on, IC output will be on OFF state. and RED LED lights. While getting -ve pulse on pin 2, circuit will be triggered and GREEN LED will start lighting. At this time, if pin 6 gets a +ve trigger, the circuit will be OFF. Update: You could also give a little electric shock if someone failed the game. Need any Assistance? feel free to click the chat box on the right bottom(when online).